Standalone Stack 2.0.7 released ! 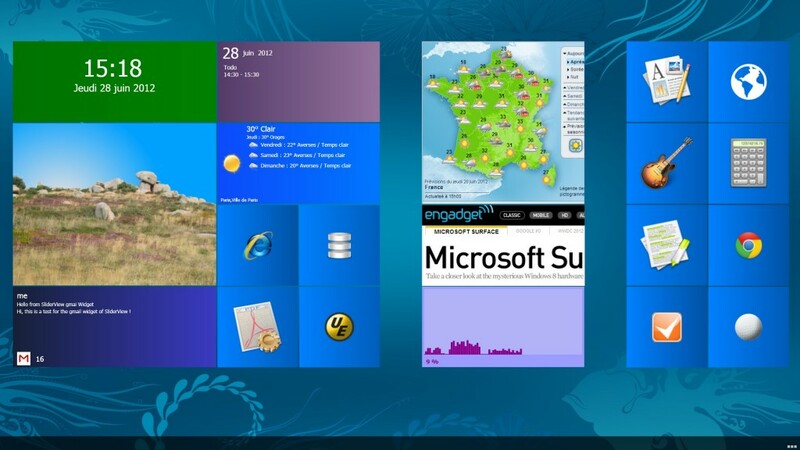 Windows 8 start screen : You can slide horizontally your widget. Thanks to JaeHyung Lee for his Korean translation of Visual Tooltip. If you have ObjectDock or RocketDock,you certainly know the stack docklet from Matonga. 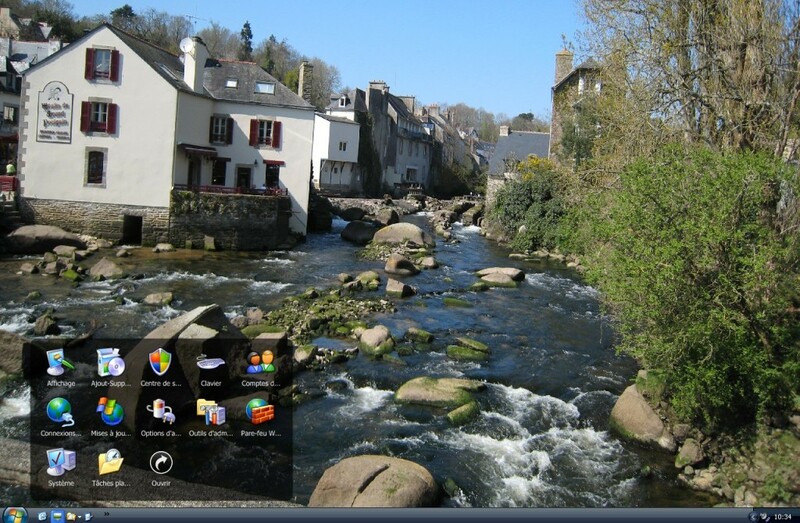 Now, if you don’t want any dock and simply use your taskbar, you can have stack view too. see StandaloneStack page to know more. – Open speed improvment. Check “keep in memory when stack is closed” to activate cache. The file list is not reloaded from filesystem. – Fix location of stack if you force the position and then change screen resolution. – Right click context menu. – “click thru” on transparent part of the icon (for stack mode) now open the shortcut. – you can force stack position on screen- numerical sorting for filename. when filename begin with a number, it is used to sort the file. – “A stack/folder in the stack can not be opened if it contains the shortcut of deleted application” should work ? Description: Open the start menu and show/Hide the taskbar. Use OpenStartMenu.exe /? to show parameters. Use /hidetaskbar to hide taskbar. Use /showtaskbar /nostartmenu to show taskbar without opening start menu. 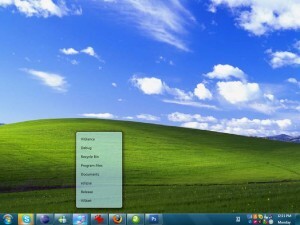 Description: Open the taskbar properties dialog at mouse location. Use OpenTaskbarProperties.exe /? to show parameters. Unzip the files in a directory, run scalable.exe. 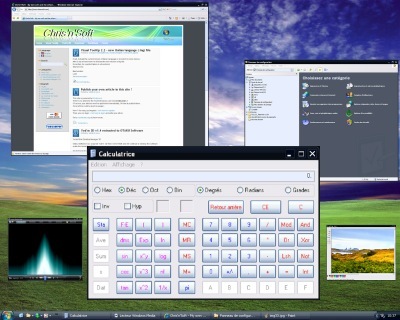 Scalable allow you to make “virtual” windows of real windows application. 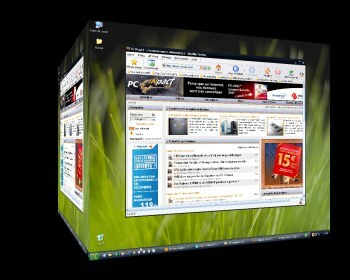 The virtual window can be used like the real windows, with keyboard and mouse. 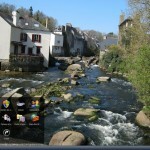 press CTRL key, hold down and click on the minimize button of the window. You should see a reduced window of notepad ( or calculator ). Now you can use it with the mouse and keyboard, like the real window. 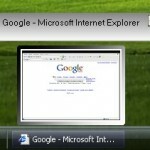 Hold CTRL key to move it with the mouse ( click anywhere on it ), or just use the title bar like with the real window. To get the real windows back, just click on the “restore” button (in the title bar of the reduced window) or press escape key. This is still a beta version, so a lot of programs doesn’t works with mouse and keyboard. The reduced menu doesn’t work. Le developpement de yod’m 3D a été confié à Otaku Software. Otaku Software has acquired Yod’m 3D from Chris’n’Soft and will continue to develop the software under the name DeskSpace. Chris'n'Soft uses Graphene theme by Syahir Hakim.